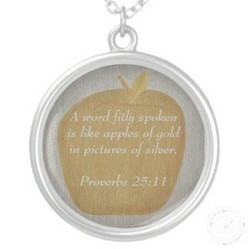 Proverbs 25:11, A word fitly spoken is like apples of gold in pictures of silver, is one of my favorite Bible verses. It really gives credence to how we speak, and to keep it kind. I have been using affirmations for many years now, and have found tips and tricks to help make them more powerful. A part of me wondered if I was doing the right thing. Reading Proverbs 25:11 assured me that I was on the right track. We are being reminded to be kind, whether to ourselves or to another. 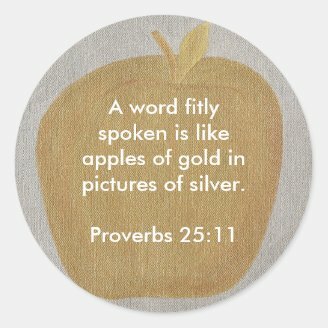 Are affirmations really related to the, word fitly spoken, verse? An affirmation is something a person affirms. 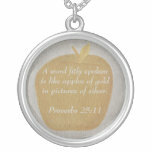 Proverbs 25:11, although not technically an affirmation, is a statement. However, that statement is implying that words fitly spoken, are related to something good, i.e. applies of gold in pictures of silver. Many times in the Bible, it talks about having faith. That means an expectation is desired. The one with faith receives their expectation, and their heart is glad. How did their expectation come forth? It came forth from a desire. Affirmations are a way to declare and/or affirm desires. Positive affirmations are desires. It is the thing unseen, that is being affirmed. That is faith. Even if what is being affirmed doesn't happen right away, it can still happen. Sometimes faith has to build, and sometimes we have to overcome the unbelief that we had. An affirmation can be positive or negative. It is simply what one affirms. Anything that we affirm, can come true. The key word here is can. One can always change how they speak, to themselves and to others, and can begin to make positive changes. One can speak positively, in the way of using affirmations, and they can also speak kindly to others; giving compliments that are sincere. Both of these are examples of words fitly spoken. I like to start my day off with positive affirmations. So much so, that I've written the whole book of Proverbs into affirmations. Do you have a favorite time of day that you like to make affirmations? I like making affirmations in the morning, to start off my day. I like making affirmations in the afternoon, to help me recharge my desires. I like making affirmations in the evening, to give me something good to sleep on. This is a sample of Proverbs that I have rewritten into affirmations. It is from Chapter 15, verses 1 - 10. 1. I enjoy being connected to Spirit. I enjoy a gentle and kind answer, it is good. 2. I enjoy dispensing knowledge to those ready to hear. 3. The eyes of Spirit are in every place. 4. Kind words bring life. 5. I enjoy being wise and listening to wise words. 6. I enjoy my treasure. 7. Knowledge is spread by those who are wise. 8. My prayer is upright and is Spirit's delight. 9. Spirit loves those that pursue kindness. 10. I enjoy listening to wisdom. I like to bless the affirmations in my heart. I place various affirmations around the house, so from time to time I glance at one and read it, thereby making a positive affirmation. Yes, they're the best kind. 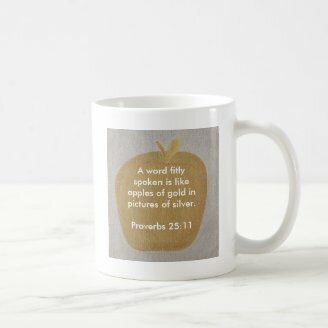 What are your thoughts on affirmations and/or Proverbs 25:11? Do you have a favorite affirmation? Using positive affirmations is a way to help create that which one desires. A positive affirmation is meant to feel good. Writing, reading, singing them helps to reinforce them. Encouragement of creative ideas is a bright idea indeed. Choose from a variety of stickers here to encourage creative and solution oriented thinking.